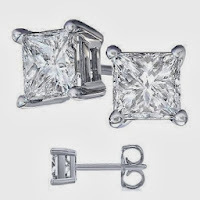 Amazon has a fabulous deal on Nickel Free Platinum Rodium Finish Cubic Zirconia Princess Cut Stud Earrings for $6.91 shipped! This are originally priced at $79.99, which makes for a great deal! This is perfect for a Anniversary, Birthday, or Christmas gift.